Sixty local students will have the opportunity to take advantage of an after-school program designed to help prepare teens for success in and beyond high school thanks to a recent donation of $5,000 to the Neutral Zone (NZ) from the University of Michigan Credit Union (UMCU). This gift was made possible with the help of 32 local businesses during UMCU’s “Shop Local Give Local” campaign. Throughout November and December, UMCU matched and donated one percent of the total sales to NZ when members made purchases with their UMCU Visaâ credit cards at participating stores. As a philanthropic credit union dedicated to the local community, the purpose of this campaign was to help make a positive difference for an impactful charitable organization while strengthening the bond with local businesses and UMCU members. 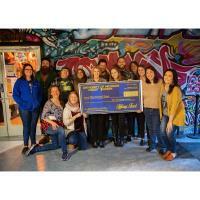 According to NZ, the donation will go towards supporting their S.C.O.R.E Education Program (School, Career and Opportunities aRe Endless) which helps teens connect with their local community, work on academic success, develop leadership and employment skills and take critical steps towards planning for future education and career goals. “I am heartened to know that so many community members value our youth and contribute to support them to take the critical steps to build a positive future. I share my deep gratitude to everyone who champions our teens,” said Lori Roddy, Executive Director, Neutral Zone. Local businesses that helped make this donation possible include Found Gallery, Spun, Rock Paper Scissors, Underground Printing, The Bo Store, Collected Works, Vault of Midnight, Bivouac, Le Bon Macaron, Heavenly Metal, Mudpuddles Toy Store, Underground Sounds, Imagine Three Beauty Studio, Downtown Home & Garden, Parrish Framing, Roos Roast Coffee, Roeda Studio, Ann Arbor Running Company, M Den, Thistle & Bess, Go! 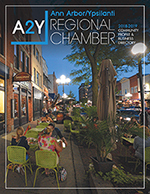 Ice Cream, Ypsilanti Running Company, Puffer Reds, Unicorn Feed & Supply, The Rocket Shop, Dearborn Novelty Art, University Flower Shop, 16 Hands, Cherry Republic, Rocky’s Great Outdoors, The Complete Runner, and Bauman’s Running and Walking Shop. “We love collaborating with other businesses in our community. It makes us all stronger and increases awareness of the importance of supporting small businesses and keeping resources local. Being able to contribute to The Neutral Zone is an even bigger bonus because they are such a wonderful organization,” Jill Damon, 16 Hands. This was the third year UMCU raised funds for a local charity through “Shop Local Give Local.” Last year, this campaign helped 200 local Girl Scouts from limited resource families gain access to programming specializing in STEM education as UMCU, with the help of 20 local vendors, donated $5,000 to Girl Scouts Heart of Michigan. “UMCU strives to be a leader in the growth and development of the communities we serve. Through ‘Shop Local Give Local,’ we are able to cultivate stronger relationships between local charities, local businesses and UMCU members because everyone is working together to make a positive impact in our community. We are grateful to all of our members and the local business owners who supported this campaign and helped make this donation possible,” said Tiffany Ford, UMCU President and Chief Executive Officer. To further engagement with “Shop Local Give Local,” UMCU continued an incentive that was implemented last year. In addition to contributing to the donation, every time members used their UMCU Visa credit cards at the partner stores during the promotional period, they were entered to win UMCU’s Shop Local Give Local $5,000 Grand Prize. David Zyczynski was the lucky grand prize winner. “Our family prefers to shop at local businesses, especially during the holidays, because we try to support the local community as much as possible. ‘Shop Local Give Local’ gave us the opportunity to not only support local businesses this year, but a local charity as well,” said Zyczynski, UMCU member. The University of Michigan Credit Union is a member owned, not-for-profit cooperative. Its purpose is to amaze UMCU members, the community, and its team by working together for shared success. UMCU is the only credit union headquartered in Ann Arbor, Michigan. When established in 1954, there were 12 members and $9 in assets. Today, UMCU has more than 90,000 members and more than $800 million in assets, and it continues to grow. With eight offices in Ann Arbor, two branches in Ypsilanti, a branch in Dearborn and three branches in Flint, UMCU serves the financial needs of the University of Michigan, Eastern Michigan University, Washtenaw Community College and their surrounding communities. For more information, visit umcu.org or follow UMCU on Facebook, LinkedIn, Twitter and Instagram.